Dr. Aleksandar Radonjić, Grad. Elec. Eng. Aleksandar Radonjić was born on September 30, 1977, in Zenica, Bosnia and Herzegovina. He graduated twice from the Faculty of Technical Sciences in Novi Sad, Department of Electrical Engineering and Computer Science: in Telecommunications Engineering (2003) and Instrumentation. He defended his PhD thesis titled Frequency-Domain Measurements within the Concept of Smart Distribution networkin 2013 at the Faculty of Technical Sciences in Novi Sad, Department of Electrical Engineering and Computer Science. Aleksandar Radonjić was elected a Research Associate in 2015.
he has been employed at the Institute of Technical Sciences since April 2015. 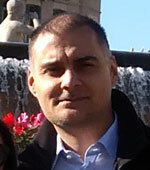 Aleksandar Radonjić is a member of IEEE, IEEE Communications Society and IEEE Internet of Things Community.